Four more records were also shattered at the championships, which now takes the tally for the five day meet to seven. Edwin Allen High lead with 131.50 points after 20 event finals, with Hydel High second on 113 and St. Jago third on 86.33. Completing the top five are Holmwood Technical (75) and Vere Technical (46). On the boys’ side, Calabar moved away from Kingston College to lead after 17 events with 116 points. KC are second with 93 and they are followed by Jamaica College on 90 in third, St. Jago on 69 and St. Elizabeth Technical, which have 47 in the fifth. Jaheel Hyde of Wolmer’s High blasted his way to a personal best, champs record and national junior best of 49.01 seconds to win the boys 400m hurdles finals. 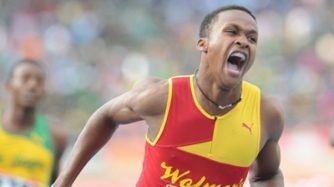 Hyde’s dominating run saw the World Youth Olympic Champion defending his title in fine style, as second place finisher Marvin Williams (51.22) of St. Elizabeth was over two-seconds away and his STETHS teammate Robin Black even further back in 52.37. Also in record-breaking form in the evening session was Jamaica College’s Clayton Brown, who leaped 16.04m in the Triple Jump Class One, although he had to settle for a silver medal in the end. Brown’s best effort was bettered by his JC schoolmate Obrien Wasome, who won the event with a leap of 16.24m, but this jump was assisted by a +2.9 m/s wind, which is above the legal reading of 2.0 — so it will not go down as a record. Jordan Scott of Campion College (15.78m, +2.7) won the bronze medal for his team. Earlier in the day, Tamara Moncrieffe of Holmwood Technical broke Kimberly Williams’ 2007 record for the girls Triple Jump after she produced a leap of 13.63m on her first attempt of the final in the morning session. Moncrieffe went on to win the event with a massive 13.92m effort, but this was assisted by a very strong +6.8 m/s tailwind. Friday’s records join Edwin Allen’s Class 4 girls’ 46.90 seconds mark in the 4×100 relay, set on Wednesday and the Class 3 boys High Jump and decathlon open standards set by Calabar athletes, Lamar Reid and Shakiel Chattoo on Thursday night. Meanwhile, the exciting 100m titles for all classes were also decided on today’s fourth day. Michael O’Hara (10.42) and Dejour Russell (10.67) won the Class One and Two boys’ titles for Calabar, while Taiwane Garriques of St. Jago High rocketed to the Class Three boys crown with a time of 11.26secs. On the girls’ side of things, St. Jago High almost collected a clean sweep over the 100m after winning in Class Four, Three and One. Shellece Clark of Edwin Allen High won the Class Two event with a time of 11.81. Joanne Reid (12.00), Kimone Shaw (11.81) and Natalliah Whyte (11.77) won gold in their respective 100m finals to keep St Jago in the title hunt. In other notable medal winning events, Fiona Richards of Buff Bay High completed a fine champs double after she landed the Class Two girls’ Discus Throw with a heave of 42.37m, Lisa Buchanan won the gold medal for Holmwood in the Class One 1500 Meter with a time of 4:37.88, while Asshanni Robb of Edwin Allen ran 4:40.73 to edged Chrissani May (4:40.75) of Holmwood in the Class Two girls’ race.